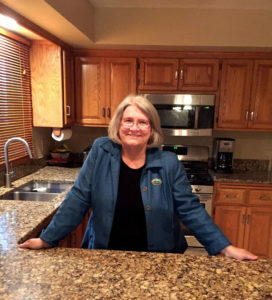 Carol Falkowski stood resolute in her Minnesota kitchen, a spoon in her hand and ground beef in a bowl in front of her. Her goal was simple: finding a way to rejuvenate the reputation of the humble but often maligned meatloaf. There was only one way to do it, Falkowski knew. To give her favorite dish the makeover it deserved, she’d have to think outside the pan. Meatloaf Outside the Pan, her ground-breaking, pan-busting book, is the result of that epiphany. Here Falkowski shares the techniques for creatively-shaped meatloaves she has developed over the past three years, showing you how to make fabulous meals that not only feed your family, but return meatloaf to the place at the table it so richly deserves. Since writing the book, Falkowski continues to produce many innovative meatloaf creations, and considers the book to be “just the beginning.” It seems everywhere she looks, she sees meatloaf. When not dreaming up new meatloaves and enjoying her latest culinary creations, Falkowski is a nationally-recognized addiction expert who has served in the public arena for more than three decades. You can reach Carol at Meatloafotp@gmail.com. Put meat in a loaf pan. Pause and bake. When it’s done it looks like a brick, for Pete’s sake! So try something different. Give it a try! But stay inside the pan? Not I! Many fond childhood memories involve sitting around the family dinner table sharing a hearty meatloaf meal. And even now people are making new savory meatloaf memories every day. A meatloaf’s great for dinner, each and every night. I do enjoy a meatloaf, every juicy bite! I try to make a meatloaf as often as I can. Nothing’s better than a meatloaf made outside the pan! It’s time to free meatloaf from the constraints of the loaf pan. Give it some flash and keep its flavor. Think outside the pan! Growing up on the Southern Minnesota prairie one could be assured of the predictable meat, potatoes, vegetable and white bread meal daily. My mother’s sister made meatloaf for dinner, the big noon meal, every Wednesday. Embellishment might include a few rubbery canned mushrooms as garnishment. On the other side of town my dad’s sister changed up the meatloaf, throwing in a can of Campbell’s Tomato Soup and few squiggles of catsup on top. That was the meatloaf I knew. No wonder a new ‘hot dish’ was welcomed. 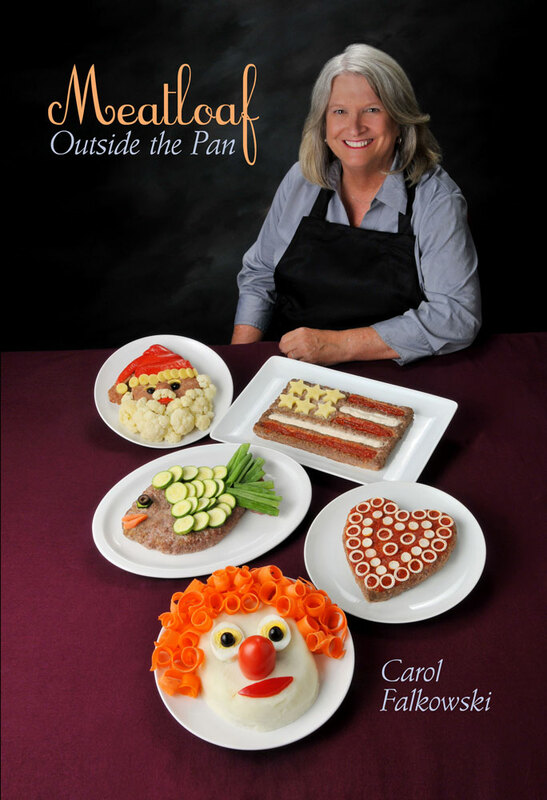 Carol Falkowski offers up any ideas for basic recipes, encourages food safety practices but really sets the table (without the pan) for creative opportunity with a Midwest standard. My Norwegian relatives would look at Carol’s American Flag Meatloaf and quickly crank out a Norse version. Certainly they’d work in some lutefisk, sardine or lefse components. Flags of the world…OK, meatloaf flags of the world with representative food components. The Clown Meatloaf with a few variations lends itself to the popular ‘scary clown’ movement. Perhaps the 2016 debate parties would have been a bit more tolerable with “Clinton Meatloaf” and “Trump Meatloaf” on the buffet table. I have my grandmother’s meatloaf pan. Whenever I come across it I have a quick thought of throwing together a meatloaf but…meh. Ingeborg like cats. “Meow Meatloaf” here I come. Wow! What a creative and fun cookbook! I’ve never seen anything like it! The instructions are easy-to-follow. The meatloaves look quite fabulous and taste great! No more plain and boring meatloaf at our dinner table! My family loves Meatloaf Outside the Pan and all the fun it has brought to our kitchen. This is a wonderfully original cookbook with one theme: creating interesting meatloaf. Who would have thought that there are so many interesting and creative ways to make meatloaf? The author offers hints on natural coloring and flavoring and gives pointers on altering recipes, food safety, and making meatloaf and vegetables appealing to kids. She offers versions of the same recipe like the pickle and vegetable fish and ways to make these creations your own. The instructions for the signature creations are clear and the author reassures the reader that with practice anyone can make these recipes look like the pictures. Meatloaf Outside the Pan will make a great holiday gift for family and friends.